"There's more to life than being a hero all the time." 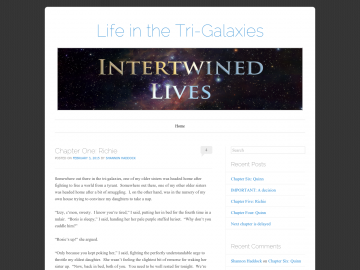 Intertwined Lives isn't your typical space opera. It's a look at ordinary life in a space opera setting. It's about what heroes do when they're not saving the day. It's about the younger siblings and kids of heroes and their struggles with everyday problems . . . with futuristic twists. It's about love. It's about family. It's about life. Intertwined Lives has not been tagged yet. Help others find Intertwined Lives by tagging it! Intertwined Lives has not been reviewed yet. Intertwined Lives has not been recommended yet.